At Cameron Park Zoo, enrichment is an important part of the care and husbandry programs provided for each species housed at our facility. Enrichment programs play an important role in the physical and psychological well being of the animals. What may look to you like trash or toys in an animal habitat is actually an enrichment activity (or the remains of one) that the animals were given to stimulate their bodies and minds. The Cameron Park Zoo has an enrichment committee to organize the daily enrichment program, raise money, and communicate with other zoo enrichment committees. 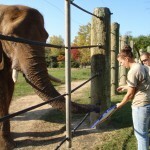 An enrichment log is kept for each animal to document how well an enrichment activity is received. 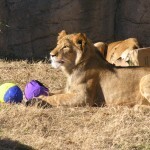 All new enrichment items and activities are approved by the Animal Care & Use Committee. Check the list below and donate items to the zoo for the animal’s enjoyment. 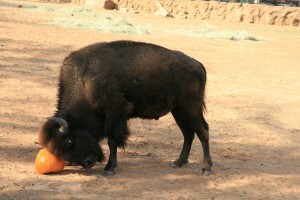 Check out the Cameron Park Zoo wish list on Amazon.com and purchase enrichment items to be sent directly to the zoo. Donate to our Enrichment Fund. The keepers and visitors at Cameron Park Zoo agree that observing the animals enjoy the various enrichment activities is equally enriching for the human species!